Do you like pears? Do you like pastries? If your answer was yes and yes, then you should try this dessert! Pear tarts or what I like to call pears on a pillow. I made them last night for Mr J and I. They were yummy. Half fill a medium saucepan with cold water and add the sugar, lemon juice, lemon peel and vanilla. Stir the water over low heat until the sugar has dissolved. Add the pears to the water and simmer until the pears are tender. Once tender, remove the pears and allow then to cool. Cut your pears in half and your pastry into quarters. Place each pear half onto each quarter of pastry. Use a sharp knife to cut a small indent around each pear. 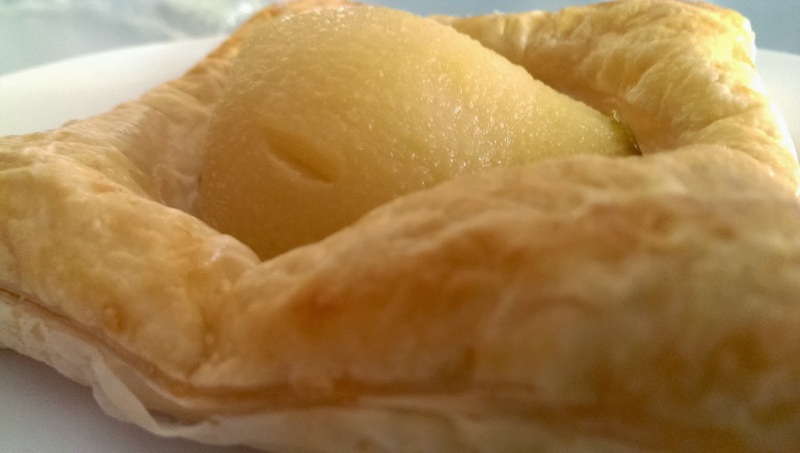 Brush the exposed pastry with egg. Bake for 20-25 minutes or until the pastry is puffed and golden. Enjoy hot with custard, cream or ice-cream.